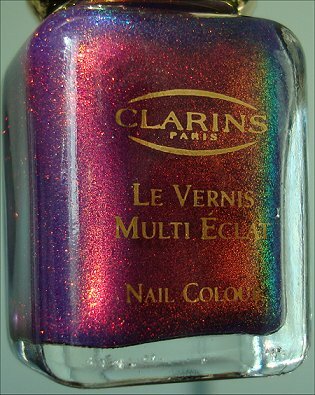 Clarins 230 nail polish is a page out of a makeup fanatic’s fairy tale. Heck, it’s even known as Unicorn Pee! This shimmery rainbow in a bottle is so unique that people are willing to pay an obscene amount of money to own. And others lucky enough to have nail buddies are swapping for it. 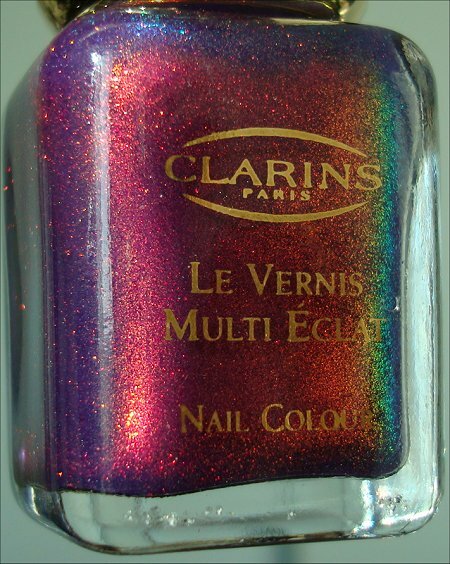 Clarins 230 is highly sought after and is quite possibly the hardest to find nail polish because it’s been discontinued for several years. Is Clarins out of its mind? 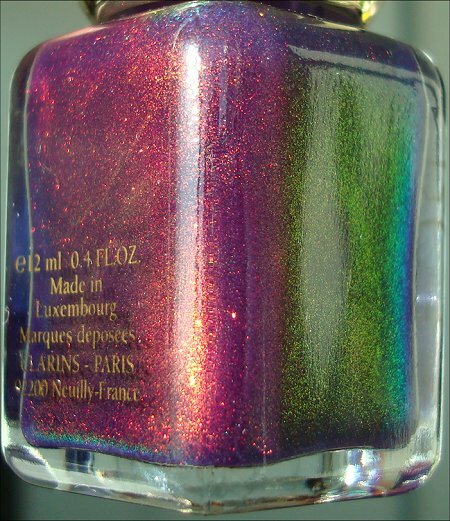 The story goes that the sparkly multichrome pigment used for Unicorn Pee doesn’t exist anymore and can’t be recreated yet. No pigment? No polish! My bottle photos turned out decent – I was able to capture the rainbow and shimmery goodness. But I was really disappointed with how my Clarins 230 swatches turned out. This polish really didn’t want to show its true beauty in the swatches even though I literally took hundreds of photos in all different lighting! 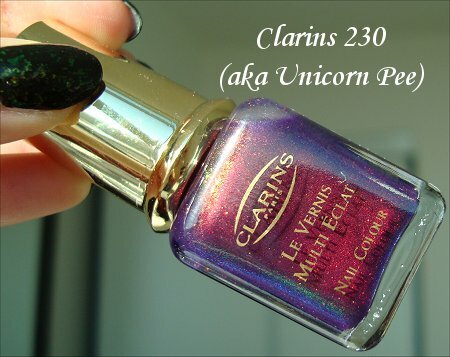 Most bloggers show Unicorn Pee swatches where they layered Clarins 230 over a purple polish. While it’s truly a mesmerizing combination, I took a different route and experimented with a dusty-blue base color – Orly Sapphire Silk (from the Spring 2011 Collection). 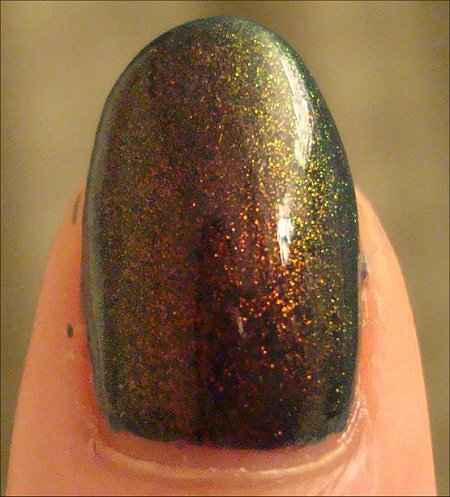 Despite my lackluster swatches, I hope that you can still get a glimpse into the wonder that is this polish. I tried to show you, but really, Clarins 230 is a polish you really have to see in person to experience the magic (as cheesy as that sounds). Unicorn Pee has acute Dissociative Identity Disorder (aka Multiple Personality Disorder)! I had to take a bazillion photos because with every slight different angle, the color changes. You may think that all the above photos are of different polishes but, nope, they’re all of Clarins 230! Unicorn Pee polish is meant to be worn over a base color. Sure, you could wear it by itself, but it’s extremely sheer, and to build up opacity, you’d probably have to wear 4-5 coats! Who wants to waste this liquid gold by doing that? Plus, when you layer it over another color, it adds depth. Most times (and by itself), Clarins 230 looks like a sheer purple with red-ruby shimmer. 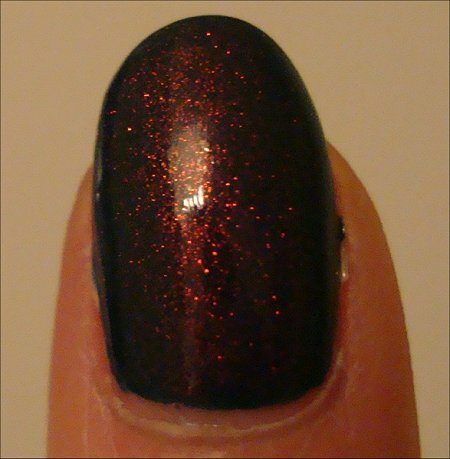 In sunlight, the red shimmer is the most dominant. But in artificial light, the shimmer shifts from red to green to orange to yellow to pink to purple. Each time you move your nails, you see different colors. It’s like wearing several different nail polishes all at once! So fun to wear! 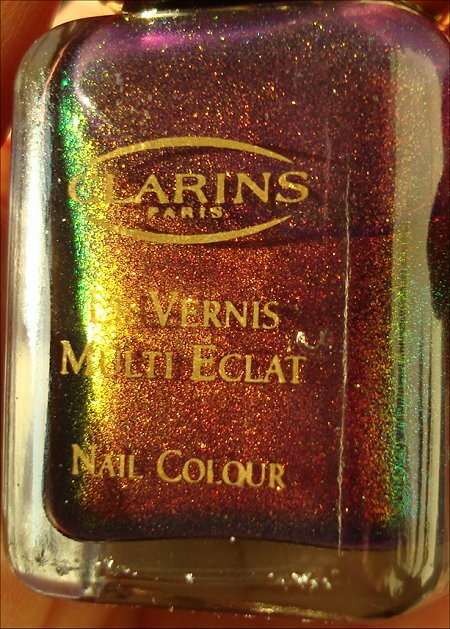 Clarins 230 polish is incredibly sparkly! 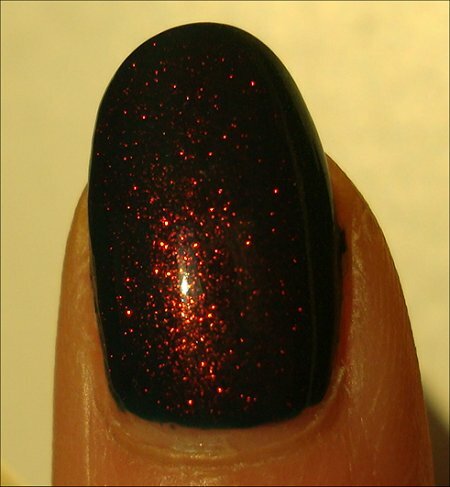 Even in dim light, the shimmer looks fiery and gives it that ‘lit from within’ look. Picture fluffy white snow with strong sunlight blazing on it. Y’know how it glitters so much that the sparkles seem to ‘dance’ or twinkle? That’s exactly Unicorn Pee’s personality. The shimmer catches the light (even in low light) and is so bright and sharp! It’s very thin and easy to work with – goes exactly where you want it to. No clumps. No stringiness. No streakiness. Flows like absolute perfection. And it dried in the same time as a typical polish. I can’t talk about Clarins 230 without complaining about the price. Just last year on eBay, it was going for even $100 (and upward) per bottle! And, yes, people were buying it. Then this year I took a look and found the prices were around the $50-70 CAD mark. Still astronomically expensive, but it was a price that a nailphile like me was willing to drop. I see this as history in a bottle since the pigment isn’t around anymore. This is by far my most coveted polish. And I doubt that I’d ever drop this kind of cash on any other color. It’s a once-in-a-lifetime type of splurge for me. Not everyone wants to pay the hefty price no matter how beautiful Unicorn Pee is. 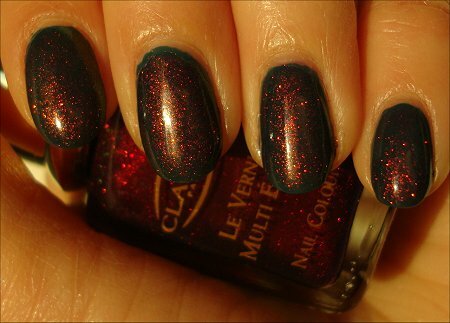 Some people have swapped with other nail-polish lovers on forums for it. And some others are even luckier and have found it in discount polish lots or even garage sales! Most people like to layer this over a purple to bring out the purple shimmer more and so the red shimmer will really pop. But I chose a dusty blue base because I wanted to coax more blue and green shimmer. I’ll definitely wear this again over another base color. Can’t wait to experiment with purples, greens, and reds! After doing extensive research, I found that the only spot-on dupe is Liquid Euphoria Bliss (which totally sounds like a drug…haha!). But that’s as elusive as Clarins 230. 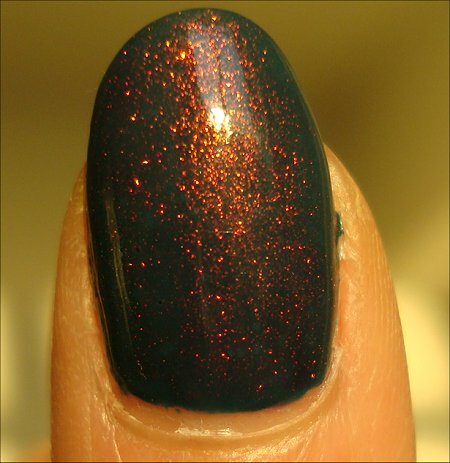 Some people have also said that the Nfu-Oh flakie polish #51 is a dupe. It’s not. Clarins 230 doesn’t have any flakies. It has shimmer. You get a completely different effect. The only similarity that these two have is that they’re both rainbows in a bottle with the same base purple. So if you’re lemming Unicorn Pee, Nfu-Oh is your more affordable bet (although it can be difficult to get hold of, too!). 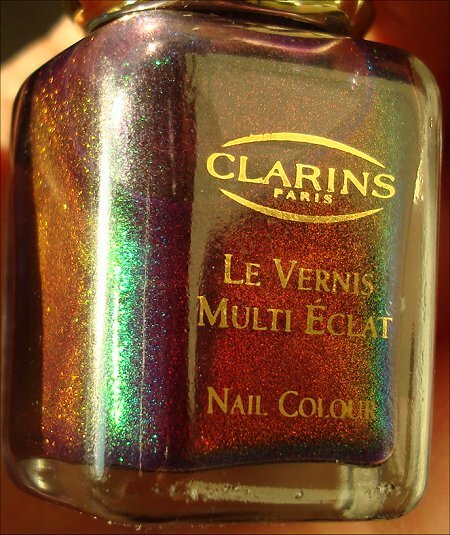 Clarins 230 (Unicorn Pee) is the most stunning and chameleon-like polish I have ever seen, and I’m very grateful to have it in my collection. If you are willing to part with a small fortune for this, do it! This is a purchase you won’t regret – it looks waaaaay better in person! Do you think I’ve lost control of my faculties by purchasing this? What’s the most you would ever pay for a single bottle of polish? 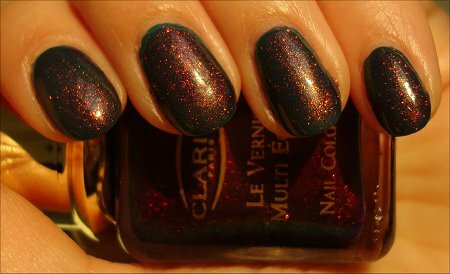 This entry was posted in Nail Polish Swatches & Reviews, Product Reviews and tagged Clarins, Orly on April 8, 2011 by Mary S.. Huge huge want. HUGE! HUGE! Well…not enough though to pay my life’s savings and my parent’s life savings. But still…want. LoL Mary you crack me up! I think I would cry if I caved and bought it just cuz i get my other polishes for so cheap. I caved and ordered NFU-Oh holos and I winced at the price even though it’s really not that expensive for an HTF holo. I’m just a cheapo. LOL! Kee recently posted: Youre a Tree Hugger Im Sew Psyched!! And when you say cry, you mean cry for JOY, right? Hahahaha! I would be half with joy, half with disbelief that I would spend $50 on a bottle of polish!! Hahaha! If we shop together, not only will we enable each other to bankruptcy, but we’ll be laughing like maniacs the whole time. Most likely!!! The store owners will probably be like “Oh great, here come the beauty bloggers.” Hahahahah!!! I think it would be fun shopping together!! And their cash registers will play their favorite song – Cha-Ching! Cha-Ching! Anyways, it’s so gorgeous…and so expensive.It makes me wonder, where are you gonna wear it? Hahaha! Yeah, it’s ridiculously expensive. But I’ll wear it still because beautiful colors are meant to be worn and enjoyed. 🙂 I’m wearing it right now and love it. I’d wear it anywhere – doesn’t have to be a special occasion. Can’t wait to try it layered over other base colors. After seeing this sell for over $100 for a few years, $60 seems like a bargain! Haha, isn’t that sad? I’m at the point in my nail polish collection where I pretty much have all the colors and finishes that are readily available. Now I’m starting to buy more HTF polishes. It’s a big change going from spending 50 bucks and getting 10 to 15 polishes to spending $50 and only getting 1 to 3. Clarins 230 has been on my wishlist forever but i think now is the time. Thanks so much for the swatches! Yeah, it is sad how it seems like a bargain. Once I saw it going for $230! That’s just plain robbery if anyone bought it for that price. Hehe, I have an Excel document with the names – sorted alphabetically and by brand. However, I got lazy and stopped updating it. Since then I’ve probably added another 80-100 new polishes to my collection. Gotta update it to, y’know, keep inventory. 😛 Haha! If it makes you feel any better, here in Australia we pay AU$19.95 for OPI polishes, AU$24.95 for OPI Designer Series and the RRP for Nfu Oh polishes is AU$32.95! So just think of all those Australian women daily forking out that amount to buy ordinary polishes from department stores and salons! 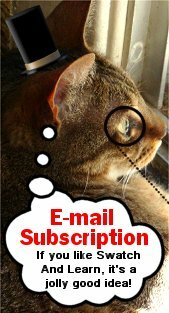 Hope that eases your conscience! “My Precious…” I whisper, to each and every one of them…. Hahaha! And do they ever talk back? Beauty Addict recently posted: New Products from ELF! The price definitely makes a person think twice about getting it. Such a shame because more people should be able to enjoy it. There’s something about a pretty polish that brightens your mood. Once I saw a blogger host a Clarins 230 giveaway. That was incredibly generous of her, and whoever got it for free must’ve been jumping up and down! Imagine the feeling! It would be nice if Clarins figured out a new way to recreate the pigment and brought back Clarins 230 version 2.0 and sold it for a reasonable price. We can dream, right? But, hey, sometimes dreams do come true! Hello! 😀 I was lucky enough to get the Clarins 230 at a 2 for 1 sale on Ebay (it actually worked out to 50.00 per bottle). Even so I am trying to franken it as well with limited success, lol (still trying to figure out how to get that green aspect). Wow, that’s a great deal – lucky you! If you figure out how to franken it, you must share your amazing discovery with us! 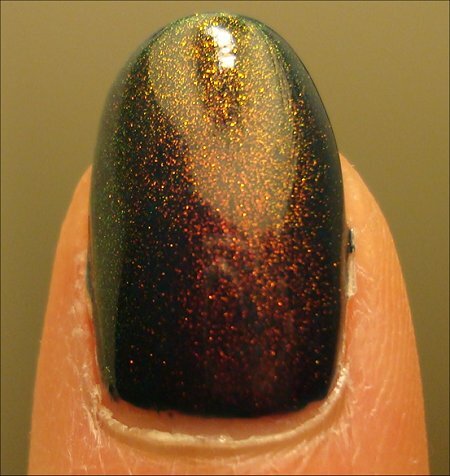 Aside from the green part, were you able to figure out the base color and main shimmer? I’m curious as to what you’ve been using so far. I have been experimenting with the Sally Hansen Amber ruby and Scarlet Ruby in a clear base with a tad of Sally Hansen Lacquer Shine Flair (makes it a bit too purple)..I was going to throw some SH Turquoise Opal in it to see if i can get the green aspect, but I want to get a backup bottle of that before I do it. The problem is, that the polishes I am using to try to franken the 230 have themselves been discontinued 🙁 A really good base with the exact shimmer/colour formulation is Maybelline Colorama Frosty Pink (although the color/shimmer is a little less saturated) but that has also been discontinued. 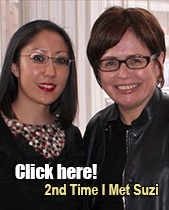 Wow, I’m impressed with your dedication to frankening Clarins 230! You’ll probably figure it out before another company takes up your challenge. 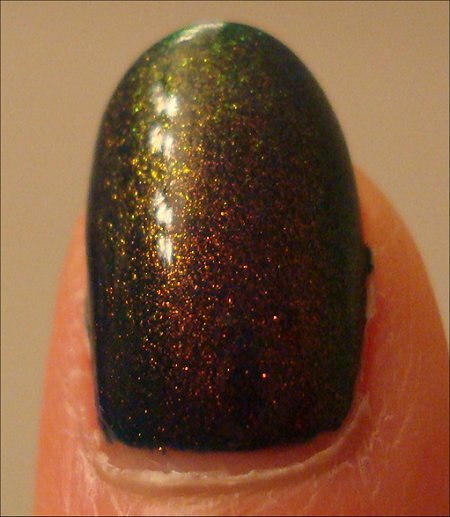 Those old Sally Hansen Nail Prisms are absolutely gorgeous – need to get my hands on them. Once I was at a discount beauty store, and stupid me put the bottle back in the bin – and there was only one! $1-something, too! What was I thinking? Even if you don’t get it spot on, I’d love to see swatches of whatever you come up with that’s even remotely similar to Unicorn Pee! Hello Mary ! 😀 I totally forgot abou this but another really good polish to attempt a franken of 230 with (and its still relatively available) is OPI Movin’ Out – only thing is that is has a lot of what I call “background noise” (pink shimmer) in it. It definitely has the change in colour although the glitter seems a bit finer. I can’t help but feel that if us Nailphiles make enough noise, that someone is going to suprise us with something similar to 230 – there is too much potential for profit. C’mon everyone…make some noise. WE WANT A CLARINS 230 DUPE! NO, NO! WE WON’T GO! Everyone, say it with me! 😀 Hello? Where is everyone? Guess I scared them away. 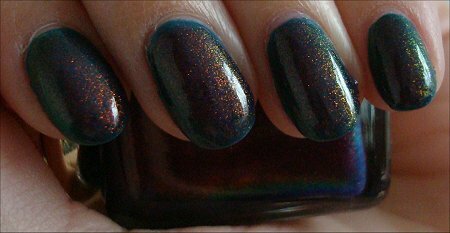 Also, I have a hrd time believing that the pigment doesn’t exist anymore because there are flakie polishes out there that have the same multichromatic hues in them right down to the green aspect (see Nfu Oh 51 and Barielle Elle’s Spell). 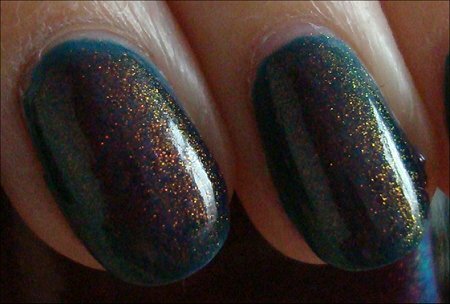 Near as I can tell, the only difference between the glitter/shimmer formation in the 230 and the flakies in the aforementioned polishes is the size of the glitter..one is a flake consistency and the other is a microfine glitter. I can’t help but wonder whether it has to do more with $$ than anything. I look at it this way..if I’m willing to pay 50.00 for a bottle of polish, then what’s an extra buck or two tacked on to what would normally be a 4.00 polish? I want to believe that the pigment doesn’t exist anymore for nail-polish companies to use. Because if it does, it’ll drive me crazy. Why no Unicorn Pee? Why, why, WHYYYY? See? Descent into madness! Maybe they can take those multichrome flakies and crush them up finely. Even if there are pieces bigger than the microshimmer and there are pieces of glitter, I think it’s safe to say that a lot of Clarins 230 lovers will be pleased. And I agree with you – a higher price wouldn’t deter me from buying it, either. But I think the companies want to target the ‘average nail-polish shopper’ who aren’t willing to spend a ridiculous amount on one bottle and not polish fiends like us…hehe! I can understand them wanting to target the average shopper, but it’s the Nailphiles that will buy 10 bottles at once, lol. Those chemists are miracle workers..somebody will figure something out. In the meantime I will continue to beg to whatever company that will listen to please make a dupe/near dupe of 230 and try to franken it howsoever I can…. Only 10 bottles? Heck, I’d stockpile Unicorn Pee to last me until I’m 90 and into the afterlife. Hahahah! I hope someone takes you up on the challenge, Andii. Whichever company it is will become rich, rich, rich! 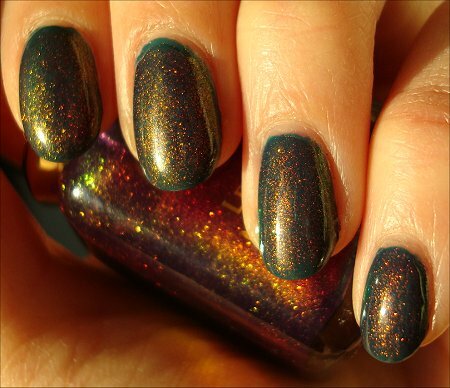 I’ve heard that the reason polishes like unicorn pee aren’t being duped anymore is because this type of duochrome-y effect cannot be achieved with the more healthy big 3-free formulas many companies have switched to! Interesting! I hadn’t heard of this explanation before. I’m sure that a lot of nailphiles would risk a non-big-3-free formula if they brought it back. But, c’mon nail-polish companies, keep trying to make it big-3-free! You’d make a killing when you release it. Hehe, I love how there are lots of reasons floating around about why no one’s duping Unicorn Pee. It really makes the polish take on a mythical nature, doesn’t it? It makes me want to start my own nail polish company but I don’t have the foggiest notion how to begin, lol. Yes, I agree with you. Clarins has a moral obligation (:D) to at least give us something to ease the lemming. Perhaps a Clarins 230 version 2.0? It doesn’t have to be spot-on if they can’t recreate it, but I’d take something that’s very similar at least. Just…throw us a bone! Something! 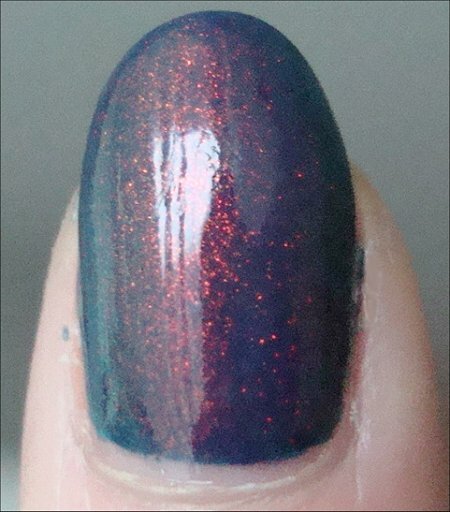 BTW, the layering over the Orly is quite pretty! Thanks! Next time I wear it, I may have to layer it over a purple. That seems to be the popular choice when I Googled it. Looks pretty over anything…well, except for this yellow I tried on a nail wheel. It ended up looking like urine unfortunately…but sparkly urine (not that it’s any better). 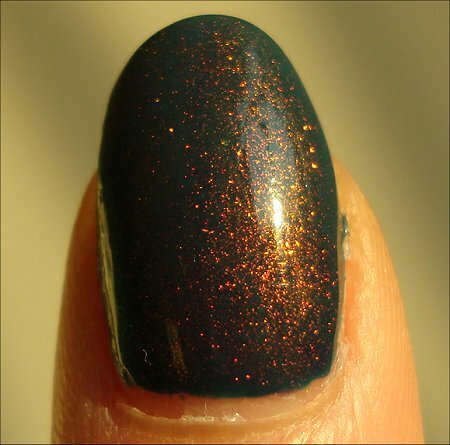 This is the most unique looking polish I’ve seen before and the fact that it’s very hard to find, makes it even more special in my opinion. I’ve been to Ebay several times just for prices alone to get an idea at how expensive it can be and some of the prices seem almost ridiculous. Even today I checked and the cheapest someone was asking for was about $50. I can’t say I’d never buy it, because maybe one day I’ll have enough money to be able to make a splurge like that, but right now it’s a definite no. Once I get a job and am making money, it wouldn’t be out of the question. I’d still probably feel a tad ridiculous/bad for buying a nail polish at that price when I know I could be buying lots of bottles at that price. But it’s so pretty, so I think I’d be able to get over it quickly. I’ve heard Nfu Oh 51 is pretty similar, so that’s always an option too. 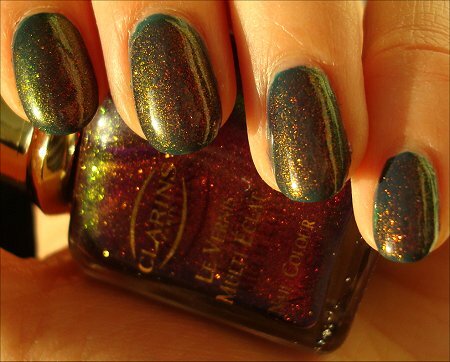 Nfu Oh 51 is a flakie polish, though, whereas Clarins 230 is shimmery. Some people actually prefer the flakie version. I like the look of both, but Unicorn Pee holds a special place in my heart because it’s so hard to come by. Wouldn’t it be great if a nail-polish company came out with a dupe for it? It would satisfy a lot of cravings for it. A comment to a very old post, but I figured you might be interested in knowing that Fantasy Fire by Max Factor could be a dupe for Clarins 230 as well. I don’t have Clarins 230 but I do have Fantasy Fire and it looks an awful lot like your swatches. I have a bottle of unicorn pee 😉 And I paid nearly $200.00 US for it. Full though, and as gorgeous as they say. 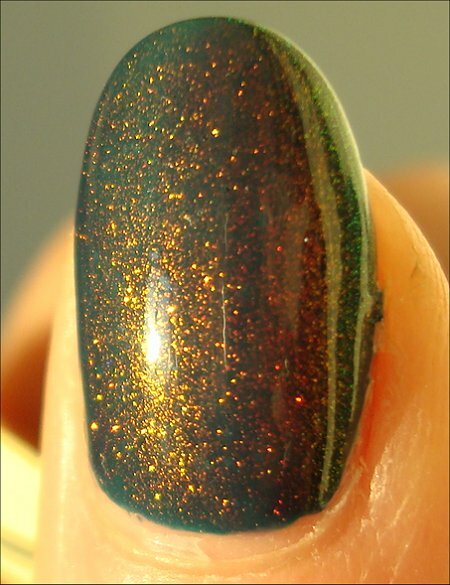 My favourite lemming … after that my fave lemming is OPI Opening Night Gold.